The position is linked to the research project “Molecular basis of heat and desiccation tolerance of bacterial cells and spores”, funded by Nestec Ltd, Lund University and the Swedish Research Council. The research work will be carried out at the Division of Biophysical Chemistry, which belongs to the Center for Molecular Protein Science in the Department of Chemistry. 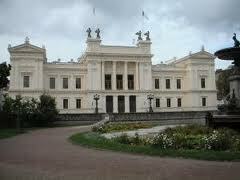 The Division is located at Lund University`s Center for Chemistry and Chemical Engineering (Kemicentrum). Kemicentrum is one of the largest research units for chemistry in Scandinavia with a staff of ca 400 and a yearly research budget of ca 350 million SEK. Research within the Division of Biophysical Chemistry ranges from water physics and nuclear spin relaxation theory to fundamental and applied problems in the life sciences, with a focus on protein interactions and dynamics. All known life forms depend on water, but certain organisms, including bacteria, can survive lengthy periods of extreme dehydration (desiccation). This anhydrobiosis phenomenon is often coupled to high intracellular levels of certain disaccharides. The most stress tolerant life forms are endospores. These survival capsules, produced by some bacteria when deprived of nutrients, can remain in a metabolically dormant state for many years. The aim of your research in this project is to elucidate the molecular mechanisms of desiccation tolerance and heat resistance in vegetative bacteria and endospores. These mechanisms likely involve protein stability and mobility, membrane permeability and enzyme activity. All of these factors are strongly influenced by biomolecule-water interactions. A major focus of the project is therefore to characterize the physical properties of water and proteins in intact cells and spores under different external conditions. This can be done with a specialized nuclear magnetic resonance technique, Magnetic Relaxation Dispersion (MRD), by measuring how the spin relaxation rate of deuterium nuclei depends on the applied magnetic field strength. For more information on the MRD technique, see: E Persson & B Halle, Cell water dynamics on multiple time scales, Proc Natl Acad Sci USA 105, 6266 (2008), and E P Sunde, P Setlow, L Hederstedt & B Halle, The physical state of water in bacterial spores, Proc Natl Acad Sci USA 106, 19334 (2009). Your main research activities in this project will be MRD and other biophysical experiments, quantitative analysis of the resulting data, and development and testing of models of desiccation tolerance and heat resistance. You will also culture bacteria and prepare samples for MRD measurements. Strains of vegetative bacteria and ultrapure endospore preparations will be supplied by collaboration partners in the project: Nestlé Research Center, Lausanne (bacterial strains) and prof Peter Setlow, University of Connecticut (endospores). These collaboration partners will also contribute microbiological expertise. The resistance of bacteria and endospores to extreme environmental stress is not only a fascinating biological phenomenon. Inactivation of pathogenic bacteria and endospores that can survive in a desiccated state and also withstand high temperatures is of vital concern in the food industry. An interesting question that also will be addressed in the project is how to use fundamental understanding of molecular mechanisms to improve existing methods for inactivating contaminating bacteria or endospores in food preparations. As a doctoral student you will mainly be working with your research project, but you can also be given other tasks, such as teaching or instrument responsibilities. If you engage in undergraduate teaching, the PhD position will be extended by a corresponding period. Within the project you will travel to visit collaborating laboratories and to participate in international conferences. Regulations for employment as a postgraduate student can be found in the Swedish Statute Book (SFS 1998:80). The general eligibility requirement for doctoral studies is a university degree of at least 240 ECTS credits, including at least 60 credits at an advanced level. We also welcome applications from highly motivated students who have not yet obtained their degree but will do so in the first half of 2011. Documented knowledge and skills relevant to the research project and study results in particularly relevant courses. Ability to work independently and to formulate and solve scientific problems. Such abilities can be demonstrated, for example, in a Master Thesis or in a discussion of scientific problems during a possible interview. The specific eligibility requirement for this PhD position is an advanced degree in Chemistry, Biochemistry, Biophysics or a related discipline, including at least 50 credits of courses in mathematics, computer programming and molecular physics / biophysics or physical chemistry / biophysical chemistry. Knowledge of and practical experience with nuclear magnetic resonance, protein science and/or microbiology is considered a merit. We are seeking a highly motivated student with the ability to perform high-quality research work. An excellent command of written and spoken English is a prerequisite. Demikian kami sampaikan tentang PhD Position in Biophysical Chemistry, Lund University, Sweden semoga informasi tentang PhD Position in Biophysical Chemistry, Lund University, Sweden ini bermanfaat.